Do any of you love travel as much as I do? One of my greatest weaknesses are castles. Ruined or restored, I adore them. One of my all-time favorites is Burg Eltz. Unlike many other castles, it’s been in the same family for over 850 years. 850 years! It was never destroyed. Never fell into ruins. 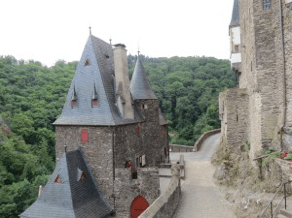 And though I always love a good ruin, the chance to see untouched medieval architecture… Actually, while that’s all true, the real reason I was dying to see Burg Eltz was because I’d decided to set a good portion of a novel there. Questions were whirling around my mind – all those tiny little details that the internet wasn’t quite capable of answering. What did it feel like to cross the bridge, to climb the stone stairs, to stand in the courtyard? Did the rooms feel small? Large? How much light filtered through the windows? How on earth did they manage to heat it? But above all, I wanted to know: how many escape routes could I pick out? We parked the car and walked to the castle along a long, twisting path through the woods. A deep dark woods. It wasn’t hard to imagine Little Red Riding Hood skipping down the path or the Big Bad Wolf lurking behind a tree. Even a gingerbread house complete with a witch wouldn’t have seemed out of place. 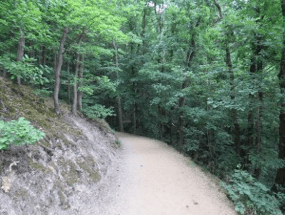 You arrive by foot and, as you come around the final bend of a forest path, it rises upward from a large rock, surrounded on three sides by the Eltzbach River. A long, arched stone bridge carried us over the river and through a gate. 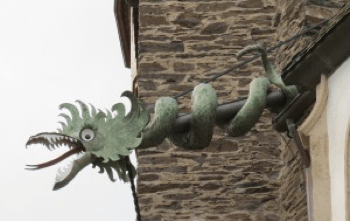 There was an outer courtyard complete with serpent water spouts and an inner courtyard that appeared to be its own village. Turrets. Half-timbered sections. And that was only the outside. Unfortunately, I can’t show you the inside here. Photography was forbidden. But the rooms on the tour were amazing. Dark wooden beams supported the ceilings. There was armor. Weapons. Murals. Tapestries. Treasure. And fireplaces big enough to stand in. Oh, and a ghost named Agnes who died defending her honor against an unwanted suitor. The castle couldn’t have been more perfect. 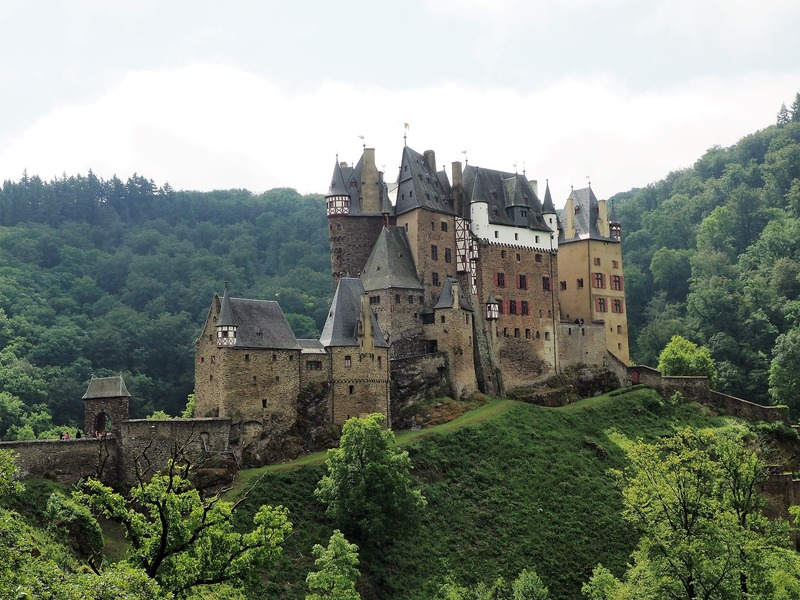 As we hiked back to the 21st century, even my boys agreed that any one of the princes or princesses from the stories of the Brothers Grimm would feel right at home in Burg Eltz. 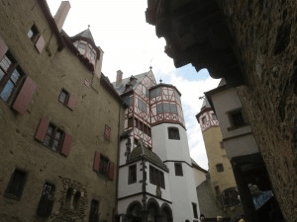 And though we would go on to visit a grand total of ten castles on our trip to Germany – and though I entered each with no expectations – none were ever quite able to match the magic of this castle. ***The Silver Skull is set – mostly – in Germany and in a fictionalized version of this castle.